Many of today's speakers can be "bi-wired." They feature two sets of connectors, which provide separate inputs for the woofer and tweeter. 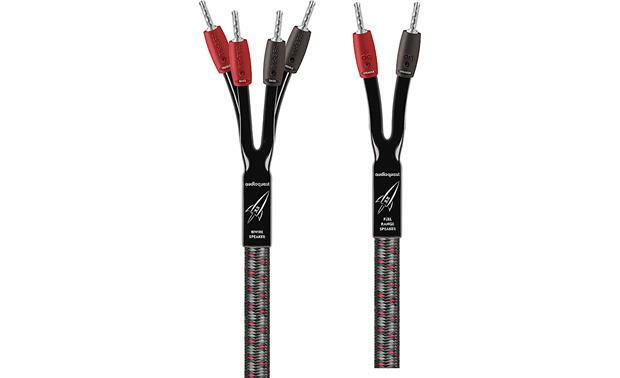 Until now, bi-wiring required using two regular sets of speaker cables, but AudioQuest's innovative Rocket 33 single bi-wire cable delivers the sonic benefits of conventional bi-wiring along with much lower cost and simpler hookup. They enable your speakers to reproduce sound as cleanly and faithfully as possible using a single cable. 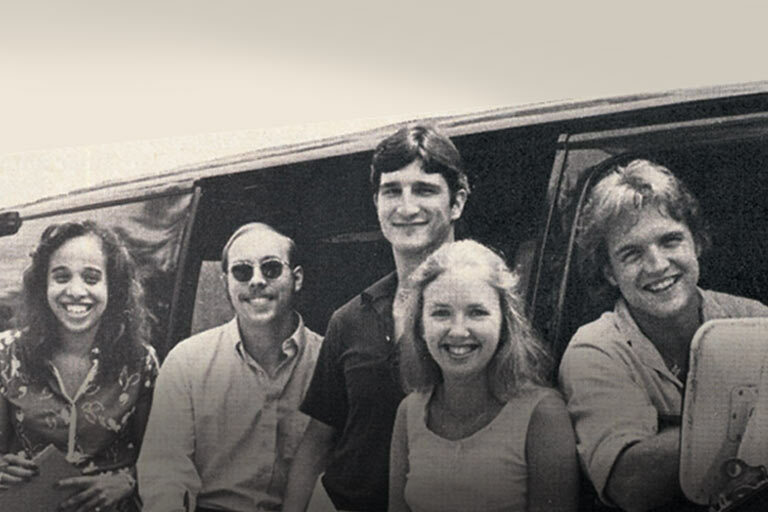 You'll enjoy sound that's spacious, finely detailed, and beautifully balanced. When a full-range signal is sent through a single speaker cable, the interaction of the magnetic fields created by the different frequencies can negatively impact the sound produced by your speakers. In particular, large amounts of bass energy can interfere with more delicate high frequencies. Bi-wiring transfers audio signals separately to your speaker's woofer and tweeter inputs, eliminating this distortion-causing interaction. If your speakers can be bi-wired, they should be for optimum performance. Each of the cable's six conductors is a single, unbroken strand of pure copper, which ensures highly efficient signal transfer with minimal loss. Solid conductors eliminate electrical and magnetic interference that can add brittleness to the sound of multi-strand conductor cables. The Rocket 33 uses a precise combination of different size conductors: 21-, 19-, and 17-gauge conductors for the high-frequency signal, and 20-, 18-, and 16-gauge conductors for the low-frequency signal (see more photos). This difference in diameter reduces the possibility of distortion caused by any particular conductor's sonic "signature." A specialized spiral arrangement of the three conductors in each bundle minimizes potential signal interaction, resulting in sound that's clearer and more dynamic. While expensive, the improvement in sound is worth it. Your speakers will sound like they cost maybe twice as much. Is this one pair for two speakers at this price ? Yes, you will find one one set each for your right & left speaker. 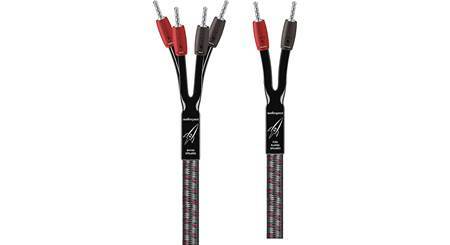 Bi-Wiring: AudioQuest Rocket 33 is a Single-BiWire cable. When the halves are separated at the speaker end, the Dual-Triple design turns Rocket 33 into a true Double-BiWire set, thanks to the magnetic autonomy of each tri-conductor section. On its own, one tri-conductor group would be a little light-weight in performance as it is biased towards treble finesse. The other tri-conductor group is biased toward the bass; its more forceful and lacking ultimate resolution. Together they form a completely optimized full range design. When separated, the Dual-Triple design lets Rocket 33 be a maximum performance Double-BiWire in a single cable. Solid Conductors: The use of solid conductors eliminate harshness and confusion due to strand interaction. All six of Rocket 33's conductors are solid. 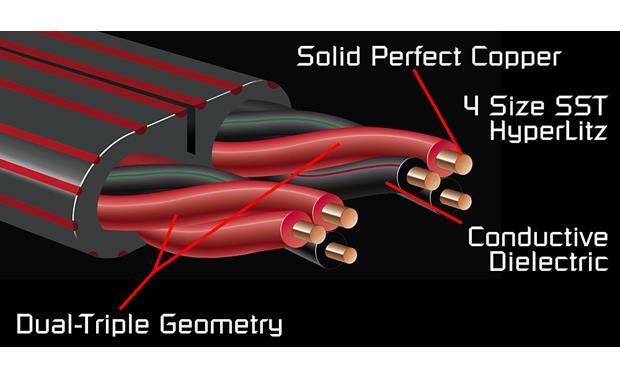 Solid conductors prevent strand interaction, a major source of cable distortion. Electrical and magnetic interaction between strands in a conventional cable is the single greatest source of distortion, often causing a somewhat harsh, dirty and confused sound. Solid conductors are the most important ingredients enabling Rocket 33's very clear sound. Whether a conductor is solid or stranded, skin effect is a prime distortion mechanism in speaker cables. Rocket 33 very simply keeps this effect out of the audio range by using conductor sizes that are below the threshold for audible distortion. Long-Grain Copper/Perfect-Surface Copper: Rocket 33 uses a combination of Long-Grain Copper (LGC) and extremely high-purity Perfect-Surface Copper (PSC). All conductors are solid, which prevents strand interaction, a major source of distortion. Surface quality is critical because a conductor can be considered as a rail-guide for both the electric fields within a conductor, and for the magnetic fields outside the conductor. Long-Grain Copper (LGC): LGC has fewer oxides within the conducting material, less impurities, less grain boundaries, and definitively better performance. Perfect-Surface Copper (PSC): The smooth and pure PSC further eliminates harshness and increases clarity. The astonishingly smooth and pure Perfect-Surface eliminates harshness and greatly increases clarity compared to OFHC, OCC, 8N, and other coppers. High-purity PSC further minimizes distortion caused by grain boundaries, which exist within any metal conductor. 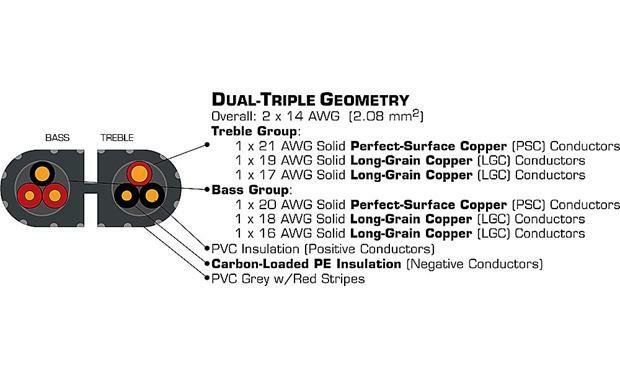 Dual-Triple Geometry: The relationship between conductors defines a cables most basic electrical values (capacitance and inductance). However, even when those variables are kept in a reasonable balance, the relationship between conductors can be varied in ways that greatly affect the sound. The Dual-Triple construction of Rocket 33 allows for significantly better dynamic contrast and information intelligibility than if the same conductors were run in parallel. The specific 3-cross geometry used in each half of Rocket 33 maximizes this advantage. Spread-Spectrum Technology (SST): Any single size or shape of conductor has a specific distortion profile. Even though radially symmetrical conductors (solid or tubular) have the fewest discontinuities, any particular size does have a sonic signature. SST is a method for significantly reducing the awareness of these character flaws by using a precise combination of different size conductors. The six different SST-determined conductor sizes used in Rocket 33 allow an exceptionally clear, clean, and dynamic sound. Directional: The PVC "pants" on either end of Rocket 33 are marked "Speaker End" or "Amp End". Please use cables in the direction required. Cold-Weld Terminations: Superior AudioQuest connectors allow Rocket 33 to be securely attached to any type of equipment. AQ ends are dull looking because there is no harsh sounding shiny nickel layer underneath the silver. The connection between the plug and conductors is made using AQ's Cold-Weld system which provides a superior connection that ensures that the structural integrity of the conductor is kept completely intact. The Cold-Weld system refers to a combination of high pressure at the point of contact and the use of copper impregnated paste. A controlled amount of pressure is used to essentially make the conductor and connector mechanically "as one" without the use of heat. The copper bearing paste acts as both a copper oxide retardant, and as well as a very effective contact enhancer. AQ's Cold-Weld system ensures a practically perfect connection. What is the overall gauge of the cable? I bought these and they came as a set, so two speakers per order. They are pretty nice, just be really careful with the plugs, they are supper thin silver and they don't look like they will stand up well if someone trips over or pulls on the wire while connected. It looks like it would be bad if they bent and obviously worse if they broke. Aside from that, I have been happy with them. Yes! One pair of speaker cables for two speakers! Great cables for the price! Fantastic sound quality! Yes it is for two speakers. Going from an Onkyo Integrated amp into PSB B6 speakers. Would Using both A-b speaker outs form the Onkyo into both sets of Inputs on the speakers be the best way to wire these, would hat actually be Bi_wiring ,and would it improve the sound? This is bi-amping, not bi-wiring. Bi-amping might damage the speakers. 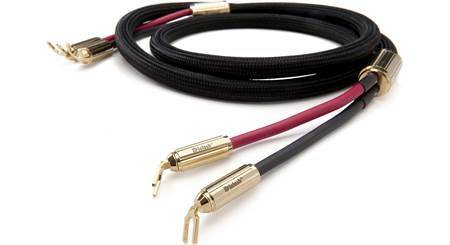 First, I would replace the PSB jumpers with short speaker cables and then use conventional cables to power the speakers. Determine if there is a noticeable improvement in the sound. Then contact PSB and ask them if bi-wiring would result in a noticeable improvement in the sound. Based on their reply, make the determination to upgrade the cables to either conventional or bi-wire. No, the end with 4 plugs goes to the speaker. The end with 2 plugs would go to the receiver. What is the diameter of the Audioquest Rocket 33 speaker cable? Thanks in advance. Do not know how the measure the diameter. It is 1/2 inch on flat and 1/4 inch on other side! Go to Audioquest website for more detail. Searches related to the AudioQuest Rocket 33 Bi-wire speaker cables with pre-attached banana plugs.